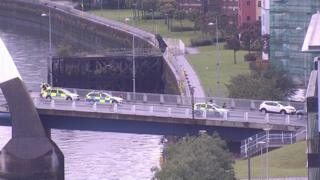 The Clyde Arc bridge in Glasgow has been closed after a pedestrian was hit by a car. Police Scotland said the incident on the Squinty Bridge took place at about 10:30 on Saturday and officers are still at the scene. It is understood the man will be taken to Queen Elizabeth University Hospital in Glasgow for treatment.